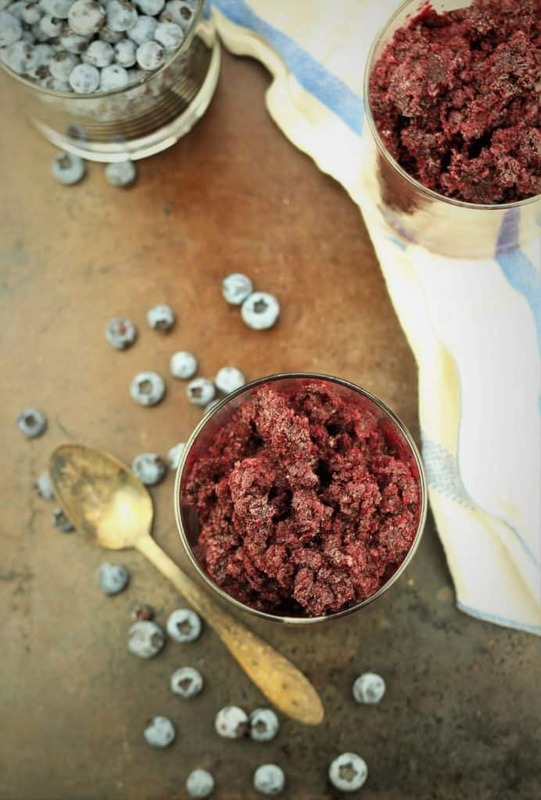 Blueberry Granita is the perfect treat for these hot, muggy days we are experiencing! 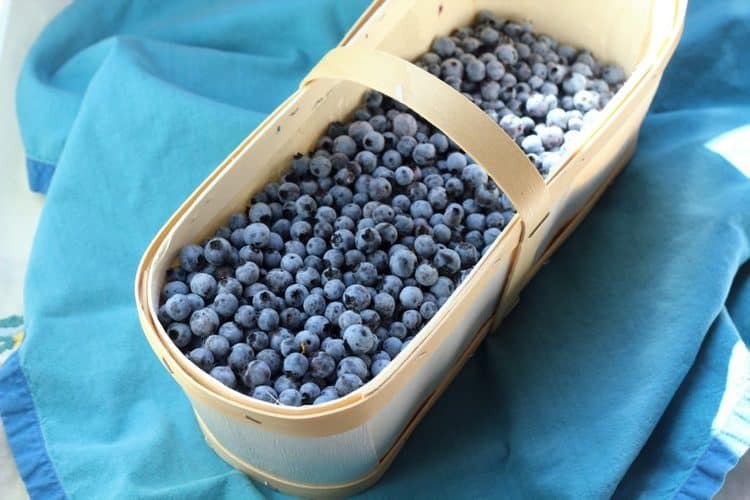 It’s also the right time to make this recipe if you’re living in Quebec and the best tiny, but oh so sweet blueberries from Lac St-Jean are abundant in all the local farmer’s markets. Originating from Sicily, granita (or Italian ice as some refer to it) is the refreshing treat enjoyed in a café with a brioche and, if you choose to indulge, covered with whipped cream! I ate so many granitas this summer in Sicily, sometimes even twice a day. Most are familiar with the traditional lemon flavored granita but since travelling to Sicily I’ve discovered so many wonderful new flavors. Each time we asked for the list of flavors available at a café, I would marvel at the choices. Here are the ones I remember: lemon; peach; strawberry; mulberry; pistachio; almond; coffee and even ricotta! I sampled the ricotta granita and it was definitely my least favorite. Can you imagine the taste of ricotta, only it’s icy textured? Not a winning combination, in my opinion. Combining flavors such as strawberry and lemon is also amazing. Unlike sorbet which has a smoother consistency, granita has a grainier, icy texture. You will notice this in the photo below. However, the consistency of granita varies in different parts of Sicily. There is somewhat of a rivalry as to which area has the best granita. My vote goes to the province of Messina! 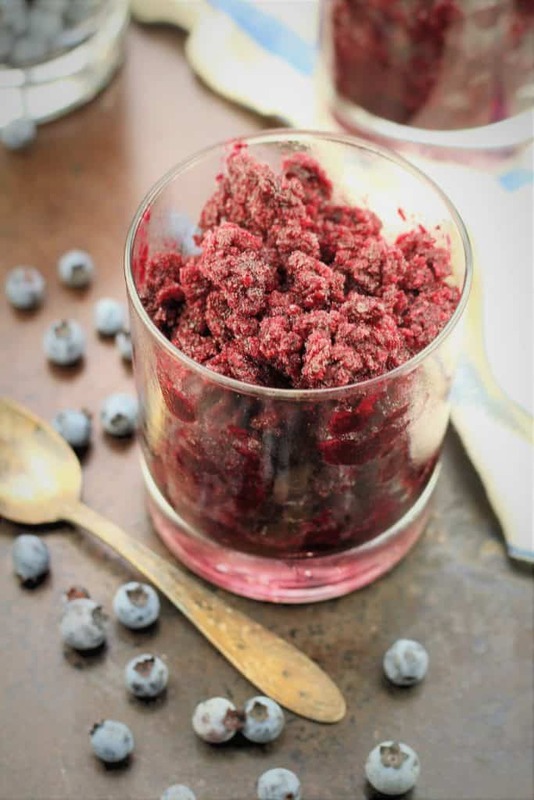 My husband tasted blueberry granita for the first time two years ago in Sicily but was disappointed when it wasn’t available again this year. Apparently, blueberries were out of season. Therefore, when I recently purchased this lovely basket of blueberries from Lac-St-Jean, I knew I had to recreate blueberry granita. Granita is made with a few simple ingredients: sugar, water, in most cases lemon juice and your choice of fruit. No fancy equipment such as an ice cream maker is necessary. A simple syrup with sugar and water is prepared, flavoured with lemon juice, the blueberries are added and simmered for a few minutes. The mixture is puréed, passed through a sieve and frozen. At this point you need to be present for the next 5 or 6 hours. As the granita freezes, it requires stirring every hour or so in order to break up the ice crystals. This process is what ensures you have granita instead of a huge blueberry popsicle! When the granita is fully frozen, it is scraped with the tines of a fork and scooped for serving. As I mentioned earlier, granita has an icy, crystallized texture but if you prefer a smoother texture, you can place your frozen granita in a food processor and blend until smooth. 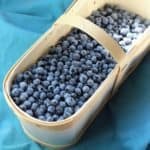 Give it a try now with fresh blueberries or go ahead and try it with other local fruits that are in season. Perhaps strawberries or peaches? If you have time, whip up a batch of Sicilian Brioche recipe for the true Sicilian experience. Buon appetito! 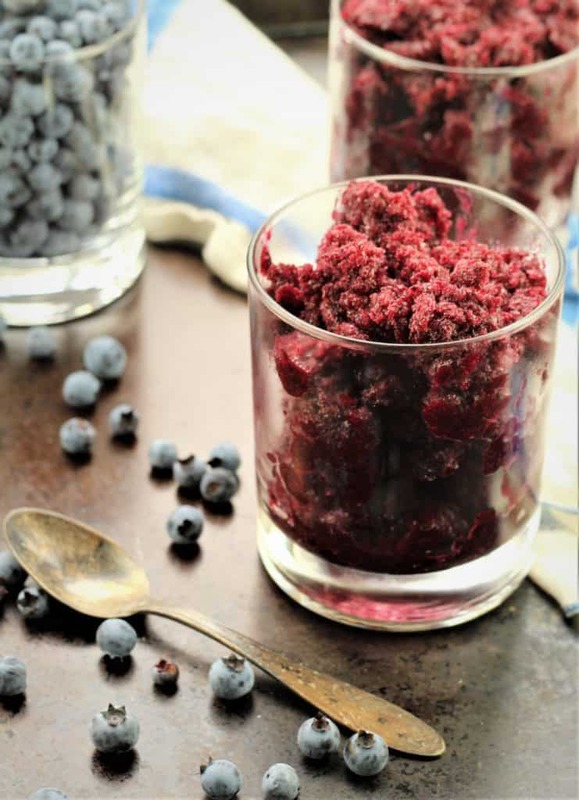 Blueberry Granita is the perfect hot weather treat. Serve with a Sicilian Brioche or even a dollop of whipped cream for a true Sicilian experience! Combine all ingredients in a medium-sized sauce pan and stir together. Bring the mixture to a boil, then lower to a simmer and cook, stirring occasionally, for about 10 minutes. The mixture will have thickened slightly and the blueberries will be very soft. Carefully transfer to a blender or food processor and purée. Strain the mixture using a fine mesh sieve over a bowl, discard the solids. 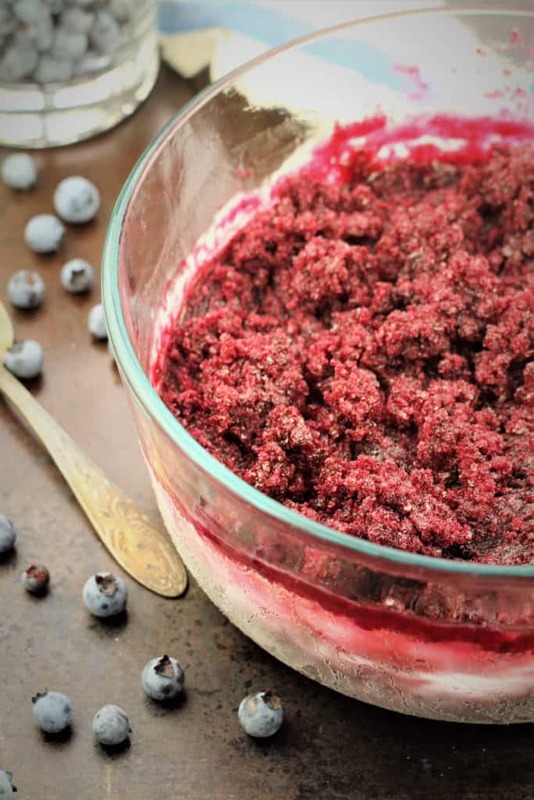 Allow the blueberry mixture to cool slightly then pour into a glass or metal bowl, cover and place in the freezer. Every hour to hour and a half, scrape the ice crystals that form with the tines of a fork. Continue to do so, every hour or so, until the granita is completely frozen, about 5 hours. When ready to serve, use a fork to scrape the granita and scoop into a bowl or glass. 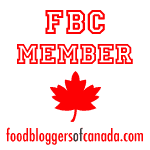 If a smoother consistency is desired, place the granita in a food processor and blend until smooth. Serve as is or with a brioche and dollop of whipped cream.